Preheat oven to 350 degrees. Grease a 10-inch tube pan cooking spray. Set aside. Peel, core and chop apples into small pieces. Place the apple pieces in a large bowl and toss with lemon juice and 1 teaspoon cinnamon. In a large mixing bowl, cream together the sugar and butter until light and fluffy. Beat in the eggs one at a time, beating well after each addition. Beat in the sour cream and vanilla. In a separate bowl, combine the flour, baking powder and baking soda. Fold into the sour cream mixture. Stir in the apples. Pour half of the batter into the prepared tube pan. In a small bowl, mix the 1 Tablespoon cinnamon, brown sugar and pecans. Sprinkle over the batter in the pan. Cover with the remaining batter and smooth the top. Bake for 1 hour 20 minutes or until a skewer inserted into the cake comes out clean. Let cool in the pan for 10 minutes, then invert onto a wire rack to cool completely. 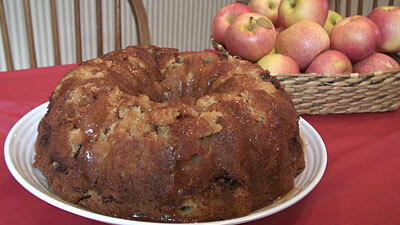 If desired, while cake is still warm drizzle with apple glaze. In a small bowl, mix the cornstarch with a couple of drops of the apple juice to make a smooth paste. Place the remaining apple juice in a small saucepan. Add the cornstarch mixture to the juice. Cook over low heat, stirring constantly, until thick and smooth. Stir in the apple juice concentrate and cinnamon. Remove from the heat and beat in the powdered sugar. Cool slightly and spoon glaze over the warm coffee cake.